The buck weighed in at 240 lbs and green scores 141 3/8". This buck was tending a doe. It came straight down my longest lane towards the stand and turned into a red brush bush at 15 yards away. The doe it was with was watching me. I drew when the doe put her head down for a moment. I held my draw for at least 40 seconds until the buck moved into a small window in the bush and I took the shot. 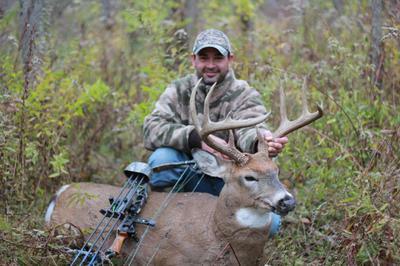 The buck walked off and bedded down 50 yards from the stand. My wife and I found it there the next morning.